Bin Laden in one of his most recent films. Bin Laden in another of his films, or it may be the same one. The Hollywood Chamber of Commerce has announced that a star on the Hollywood Boulevard Walk of Fame is to be dedicated to Middle Eastern film actor/director Osama bin Laden this week. Bin Laden, known primarily for his short films, has gained popularity recently among cinema aficionados for his unconventional style of filming. His pioneering techniques include long stationary shots focused on one character. 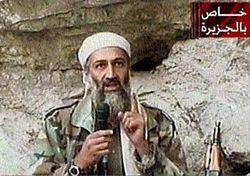 Fans of bin Laden claim that this cinematographic approach puts emphasis on the spoken lines rather than fancy camera tricks, resulting in a “purer” film. Indeed, many of his short films are essentially monologues. 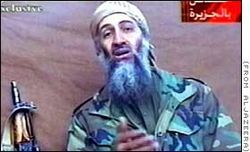 Bin Laden, a classically trained actor, appears in many of his own films. Though often slammed by critics for his repetitive delivery, clichéd lines and lack of physical emotion, he has consistently cast himself as the major – and usually only – character in his pictures. Supporters insist that the redundancy of his lines, often repeated through several sequential films, only increases their impact. The enigmatic, reclusive bin Laden typically keeps the release dates of these films secret, but that has not stemmed the tide of enthusiasm from the worldwide cinema scene. Because of their conciseness, impact, and a deal with a number of major television networks, these movies are viewed by hundreds of millions of people within a few days of their release. Though the current film cycle is unfinished as yet, its ethical, religious and political implications have already polarized the world. A voluntarily early retirement is unlikely for bin Laden, who insiders say still has the passion for film that prompted him to enter the industry in the first place. One assistant to bin Laden, speaking under condition of anonymity, confided to UnNews that the only things that could get in the way of Bin Laden’s career are health issues that might arise from his grueling dedication to meeting deadlines and filming on location in the rugged wilderness of rural Afghanistan. The dedication ceremony for bin Laden’s Walk of Fame star is set for March 10, the director’s birthday. According to his agent, he will not be able to attend, but is expected to send a taped message to the Chamber of Commerce professing his thanks for the honor. This page was last edited on 27 October 2014, at 19:47.